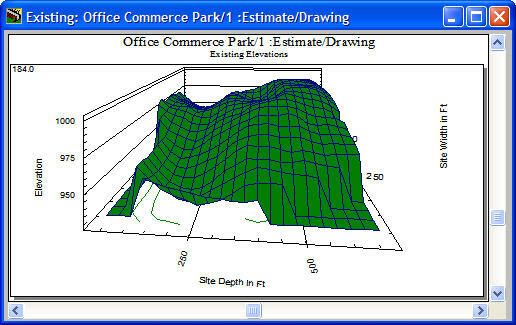 QuickDIRT is the easiest to use earthwork estimating system available. You may have up to 99 drawings and up to nine stratas of excavated material. Soil Borings specify the elevation of each strata. Line types of contours (open or closed), inclined lines, or shear lines (a sudden change of elevation) may be used to specify elevations for the existing or proposed stratas. Spot elevations are processed using linear regression techniques to create three point planes. The Perimater (a closed polyline) defines the area to be calculated. Named Areas may be associated with either the existing or proposed stratas and allow deductions from the mass site calculation for top soil stripping or paving thickness. QuickDIRT uses integers rather than floating point numbers to calculate coordinates and elevations assuring very fast and accurate calculations to a hundredth of a foot or meter. The graphic presentation of the strata surfaces allows you to rotate, pan and zoom to get a close look at the calculations. Sections may be created for any X or Y Section coordinate, showing the existing, proposed and each sub-surface strata. A Grading Map shows in color the cuts and fills at used specified grid intervals from the origin and it may be used as a staking diagram. All graphics may be printed or saved to a graphics file. The Estimate Totals show the cuts, by strata, the fill and the sizes and quantities for each Named Area. Import CAD (DXF) files, by layer, for Existing or Proposed surfaces. Road and Trench Takeoff from Templates assigned to a centerline by Station. Calculate the estimated cost of the earthwork takeoff using an Excel compatible template.